A muggy afternoon, good for staying in the AC and making cards. I was able to use some more of my lovely paper from Gotta Scrap http://gottascraprockwall.com , and when I found a couple of these other challenges they made me think of my favorite pink and brown plaid jacket my Grandmother made for me when I was in high school, oh my, some happy memories. Supplies: Card Blank Ivory-Hot Hues 5" X 61/2" Hobby Lobby, pink, brown, and white card stock from my paper stash, ribbon-Michael's, brads from my brad stash, Iron Orchid Designs-Flirty Little Secret Shimmer paper, Ink: Ranger Archival Ink-Sepia, CTMH-Z2102 Baby Pink, CTMH markers-Sweet Leaf, Buttercup, Creme Brulee, Blush, Bubblegum, LePlumeII markers-bubblegum pink, pale pink, dusty pink, Stamp: Studio G-VS4911, Fiskars Shaper Cutter-Ovals-1, Spellbinders Nestabilities-S4 127 Classic Scallop Squares Lg, S4 111 Classic Scallop Oval Lg., pop dots. That was me that deleted that comment on the card below this one! I clicked on the wrong link! Oops! Anyway, just wanted to say that you made a wonderful little card. I am so happy you got to play with us this week! 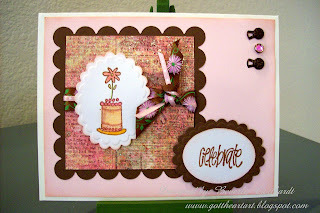 Nuttin' better than a pink and brown card! By the way, the other little ATC I accidently commented is wonderful too! Great cards! Beverly, love this! I love the square and ovals together! Great job! Love the colors you used too! Thanks for playing along with the Viva La Difference challenge - Pile it ON! Thanks for sharing with The Pink Elephant this week!! !